With all the avenues of enquiry immediately available to us now pursued, where do we stand on Greek pyramids ? First of all, we have to say that some of those cited as being such, simply aren't. The Taygetus mountain pyramid would seem not much more than a fake, a ludicrous suggestion by those we call pyramidiots who muddy the water with fanciful claims they know they're unable to substantiate. Others fall into the wishful thinking category, like the one at Thebes (not the Egyptian place) which at face value is nothing more than a circular burial earth mound, whose slightly stepped construction is it's sole provenance for authenticity as a pyramid. We don't agree. Sikion had some interesting features but just wasn't the right shape. However, the remains of those in the Argos prefecture do seem to have some of the characteristics of a true pyramid structure. They have four corners, are roughly square at their base and what remains of their exterior walls seem to be inclined inwards, so we will concentrate solely on these. Four examples (so far) are known: Hellenicon and Ligourio which we visited, Dalamanara which although now destroyed was clearly recorded in the written accounts of earlier travellers and Nea Epidaurus which eluded us although we do now have some photographs of it. Despite the apparent shape of what remains today, they were almost certainly never true pyramids at all, just the bottom half of one. They were most likely the stone bases to square wooden towers that were built on top of them. 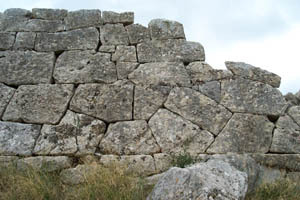 The size and frequency of the notches cut into the top layer of stone to secure the supporting beams indicate that these towers may have been quite high. In their time though, these structures would have looked significantly less like a pyramid than some of the remains do today. What were they for ? All the locations of these pyramid-towers have very strategic positions, with commanding views over the surrounding terrain. Hellenicon and Dalamanara are close to the Argolic Gulf and we know, would have been even nearer to the sea aeons ago. As possibly would Nea Epidaurus have been, which covers the Saronic Gulf on the other side of this peninsular. Ligourio sits with it's back to a mountain in a large valley in which the road between these two coastlines ran, as it still does today. Therefore, we feel these were fortified observation towers, part of an ancient early warning system to alert against invasion, particularly from the sea. Who built them and when ? This is the really controversial bit. The established story, that Hellenicon was built to commemorate a battle around 4BC seems totally wrong. Amongst many other discrepancies, it fails to explain the existence of the others which are extremely similar in both size and construction style. The recent dating of Hellenicon to 2700 BC and Ligourio to 2100 BC by optical thermoluminescence is more appropriate but is also not without problems. We need to do a bit more checking back home but so far our conclusion is this - the most likely builders were the Mycenaeans, a fierce and warlike people who's city state system was centred in the Peloponnese but whose influence and control eventually spread to the Islands and pretty much all over Greece. These are the guys who fought the 10 year Trojan War over in Turkey to recapture Helen, wife to one of their several kings. They reached the height of their powers between 1600-1200 BC but unfortunately, their culture doesn't get up and running until about 2100 BC. This conflicts with the Hellenicon date but is spot on for Ligourio. Hellenicon masonry This dating method's accuracy is not assured but it is clearly in the ball park. 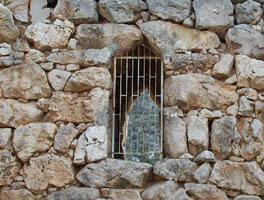 The distinctive stonework is also more compatible with an early Mycenaean period too. Mycenaen arch The jigsaw style was later superceded by more regular blocks, presumably a result of productionising' the building process. 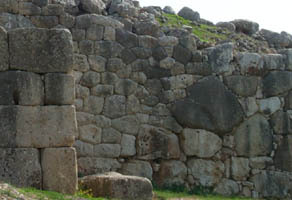 Mycenaeans continuously reinforced the defensive walls of their cities and those at Tiryns are 20 metres (65 feet) thick, a little excessive given it was the bronze age and the worst that could be thrown at you was a stone or maybe a spear. Importantly though, the Mycenaeans are known to have had extensive links throughout the Mediterranean, including the all dominant superpower, Egypt. We think it quite feasible that some visiting Mycenaean, having seen the Great Pyramids at Giza (built about 2600 BC) was inspired by the defensive potential of their shape and perverted the originals spiritual purpose into something more militaristic, as was their mind set. 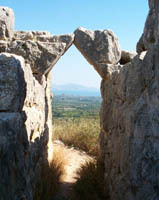 So, pending a little more research, there you have it - The Search for the Forgotten Pyramids of Greece. Not the oldest pyramids in the world as some would have us all believe and indeed, not really pyramids at all. But interesting nevertheless and a chance to get an insight into a fascinating bronze age culture. He never specifically names it and so it's always been presumed by all that he was referring to Hellenicon, probably because it's the only thing that even vaguely resembles one. We don't think this can be correct. 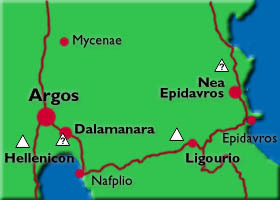 A glance at the map shows that Hellenicon is not on the road between Argos and Epidaurus, in fact it's almost in the opposite direction. So which one did he see ? Well, it can't be Ligourio because that sits against the base of mount Arachneo and would have been to his left on the road. Nea Epidaurus is too far on and so by elimination, it's much more likely he was referring to Dalamanara, now broken up and built into a church. Unless of coarse there were more, the foundations of which will be all that remains, buried somewhere in a citrus grove or hidden on some remote hillside. It's an intriguing thought but we'll leave that possibility and the search for it to some other fellow explorers. We have other pyramids, all around world to explore first.